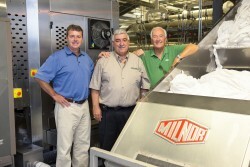 A devastating fire at Superior Laundry Service near Niagara Falls strengthened the bridge between Milnor and the laundry's DeCicco family resulting in a new beginning. Standing before the smoldering remains of what used to be the company he had built, John DeCicco was in shock. John had owned Superior Laundry Service for 17 years, and on 7 April, 2011, it was no longer a familiar place of business; it was a fire scene. 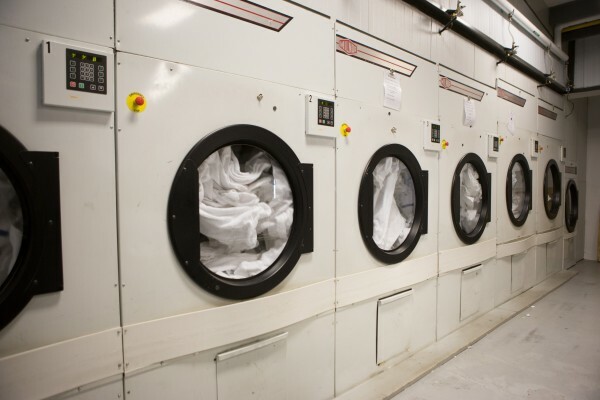 Today, Superior Laundry employs over 50 full-time workers who process between 79,379 to 88,450kg (175,000 to 195,000 lb) of linen and uniforms per week, running seven days a week, 365 days a year. 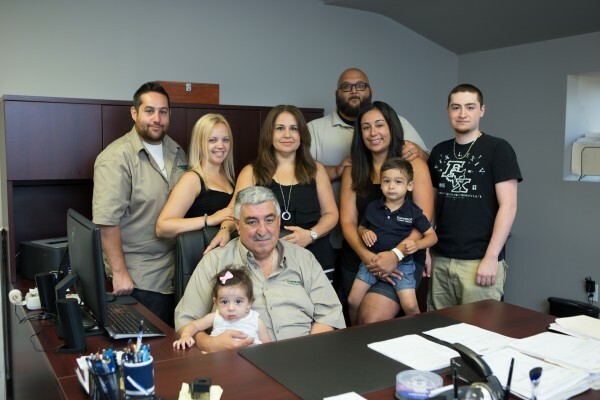 “That’s 366 on leap years,” adds John, the proud president of a thriving family business. Superior was rebuilt on the original grounds in Welland, Ontario, Canada, where 85% of its goods come from the Niagara Falls hospitality industry. Though Niagara is only 30 minutes from the plant, Superior has as many as three of the company’s five trucks traveling to or from the Falls at any given time to keep up with the demand. The 1,022sq m (11,000 sq ft) plant is able to fulfill its customers’ needs through a longstanding relationship with its local Milnor distributor, Dalex Canada Inc., and Milnor’s regional sales manager for east-central Canada, John Rasimas. All of Superior’s washers and dryers bear the Milnor logo thanks to Wayne Currie, sales representative for Dalex and John Rasimas. 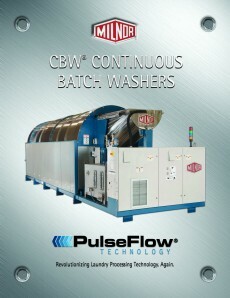 (110 lb) PulseFlow batch washer. 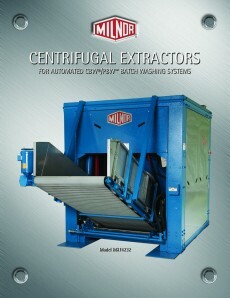 While one system uses a centrifugal extractor to remove excess water, the other uses a 50kg (110 lb) single stage press. Superior has seven gas dryers: four M175, two M190, and one M758. The plant also utilises Milnor washer-extractors for smaller loads. It has one suspended, open pocket 125kg (275 lb) 48040F7B, two 45kg (100 lb) 36026V6J, and one 27kg (60 lb) 30022M5J. Wayne describes John DeCicco as “a true Milnor customer,” and jokes that even the walls of John’s offices match the warm gray paint featured on Milnor equipment. is not. In detailing his own company’s strengths, John highlighted a commitment to excellence that Milnor, Dalex, and Superior all share. It was this confidence in Milnor and Dalex that gave John the reassurance to reopen Superior Laundry Service only six months after the fire demolished it. Although a disaster, the fire provided John with a clean slate. Superior Laundry Service is now the example of an innovative, well-organized laundry and customers are frequently invited to tour the site. “They tell me right off the bat there’s no comparison,” John says. Today’s facility has dedicated troughs for chemical lines to prevent potential harm to employees and goods in the event of a leak. It also has an enclosure for the back of the dryers, lowering the noise and the temperature, and preventing lint build-up. Additionally, John required a small soil-sort area. Only 70 sq m (750 sq ft), the area encourages workers to prioritize processing soiled goods, avoiding backlog. “leap frog” design to create a smooth flow. John explains that without the PulseFlow system to maximize kilograms (pounds) processed per hour per square metre (square foot), Superior would never have been able to contain its soil sort to 70 sq m (750 sq ft). Because the PBW systems break loads into smaller increments, only one worker is needed in the receiving area to load both PulseFlow systems. This is a change from the days Superior relied on a 250kg (550 lb) washer-extractor that generated intimidating loads for the workers. When it was time to order the equipment, John knew if he was going to do it, it had to be state-of-the art. So he worked with Dalex and Milnor to order his first of two PulseFlow batch washers and accompanying four-pocket weighing conveyor and centrifugal extractor. John also knew he needed the business to reopen quickly. “The biggest thing was the families that relied on this business,” he says, speaking of his employees, some of whom had previously lost jobs to fires. The order was placed in May 2011 and, given the situation’s urgency, Milnor worked to expedite the lead time. Equipment began shipping in July. “Right then and there I knew in my mind that I made the right choice,” John says. Since incorporating PulseFlow, productivity has increased a great deal. 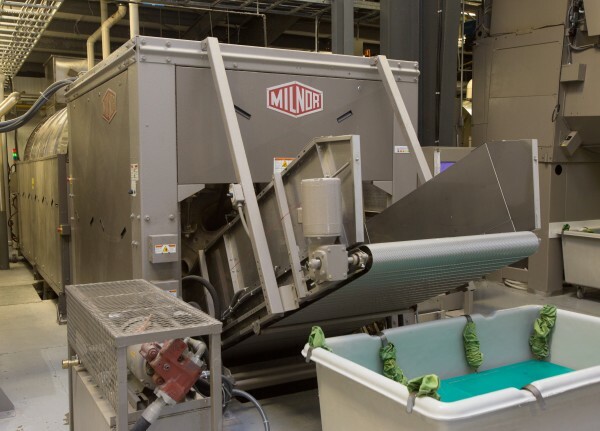 With Milnor’s first-rate engineering, Superior’s pride in caring for equipment, and Dalex’s remarkable service, John notes that “down-time is very, very little”. In fact, he laughs, sometimes workers have to pause a PBW to catch up down the line. Soon John required a second system. He worked with Wayne and Milnor’s Laundry Engineering Department to arrange for another 5 module 50kg (110 lb) PBW and weighing conveyor, and matching press, shuttle, and dryer for 2014 installation. While kilograms (pounds) per hour has increased 100%, water use per kilogram (pound) has actually decreased 65%. This drastic cut led the City of Welland to visit the plant no less than three times, checking the meters for malfunction. Of course, the City found no problem with the meters, but only the problem of adjusting John’s water bill. 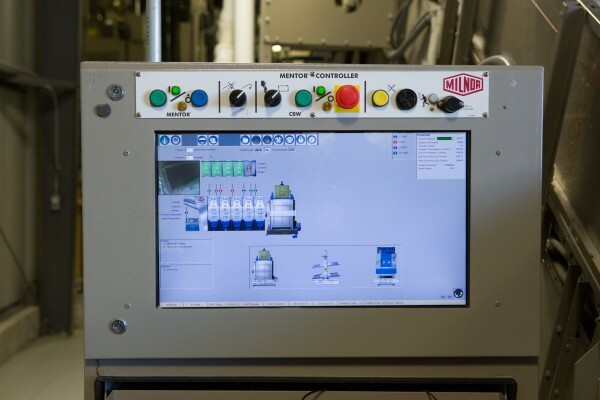 The two PulseFlow system Mentor controllers Dalex installed have also been key in reinventing Superior Laundry. John notes, because of the Mentors, the laundry “is moving as quickly as the CBW can pump out the goods”. Their automatic printers create tickets that follow each customer’s load, relieving the staff of extra paperwork and processing time, so kilograms (pounds) per operator hour have increased without overwhelming employees or creating the need for more personnel. October 13, 2016 will mark the five-year anniversary of Superior’s reopening, and John and his family run the plant better than ever. It’s easy when you love what you do, he explains in his office, surrounded by his family, and glancing out the broad window that showcases the original 232sq m (2,500 sq ft) area which survived the fire. The DeCiccos look forward to working with Milnor and Dalex in the future. “We’ve all grown to be good friends over the years,” John Rasimas said, as the DeCiccos maintain their reputation for being “true Milnor customers”.